Aquariums are the perfect way to add soothing beauty to your home or office. Beyond the visual appeal of an aquarium, the activity of the fish & corals within your tank will also create a soothing atmosphere. There are many studies proving that watching an aquarium alleviates stress and can lower blood pressure. There is nothing like a clean pristine aquarium, and that's where our Professional Maintenance Services come in. Let us do the work keeping your tank inhabitants healthy and happy, and your decor feature showing it's best. The aquarium experts at Aquarium Illusions can offer you an assortment of aquarium maintenance services options and packages. Our aquarium store in Edmonton not only sells fish, coral, invertebrates, freshwater and saltwater aquarium supplies, and other essentials you need for your fish tank, we also offer complete fish tank maintenance and services. Our aquarium service technicians are professionally trained with extensive knowledge and experience. Whether you have a freshwater or saltwater aquarium, choosing to get professional aquarium maintenance services has plenty of benefits. Let’s take a look at some of the benefits you get when you choose the experts from Aquarium Illusions to handle your fish tank maintenance. If you do not keep up with aquarium maintenance, it is likely that the water in your tank will become clouded with contaminants and attacked by algae. While it is often difficult to find the time to stay on top of regular cleanings to prevent these issues yourself, taking a brief moment to call Aquarium Illusions is all you need to do for a healthy and beautiful tank. When you contact us, you’ll get a visit from an expert in aquarium upkeep who will not only be able to clean up current problems, but also prevent those problems from happening again. They’ll also advise you on what you can do to keep those problems from recurring. Another benefit of hiring an aquarium maintenance company is that it provides a perfect opportunity for periodic aquarium and livestock analysis and reports. Our professionals always complete a service report, tracking essential information, such as all water parameters, the temperature of the tank water, algae growth, fish health, the condition of aquarium equipment,, filtration servicing, additive dosing, detailed comments, a list of work performed, percent of water change, items delivered, items required at next service, and any other special duties to be performed at next service. These service reports are viewed each time before returning to work on your aquarium to ensure our technicians are best prepared for the job. Often, our trained eyes can detect problems earlier than the average aquarium hobbyist, giving your aquarium a better chance at recovery. When you choose to put aquarium maintenance in your own hands, you will likely find yourself making continuous trips to your nearest fish store to have your water tested or to purchase premium tank water, salt mixes, and other fish tank supplies. 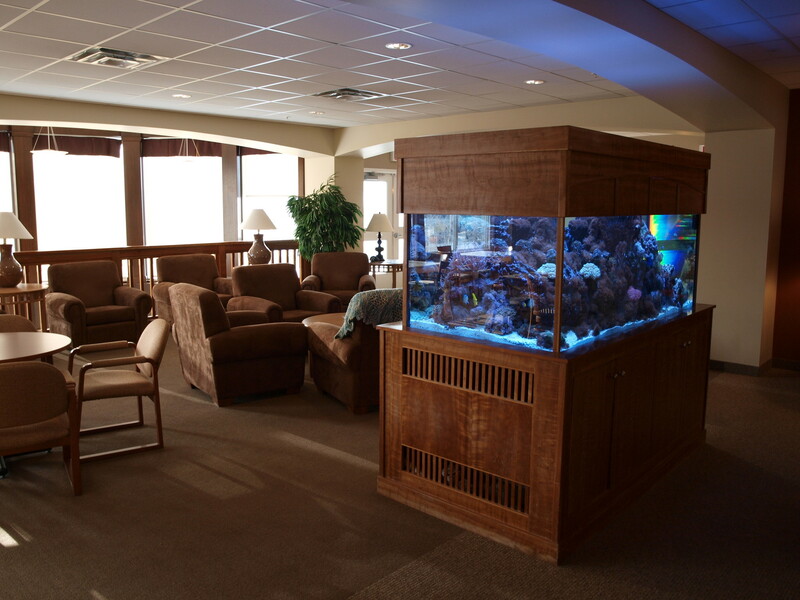 However, with professional services from Aquarium Illusions, these supplies are brought right to your home or office. Because we use the supplies that come from our Aquarium Store in Edmonton, you can rest assured that we will only use the best aquarium products to provide your tank with the best possible support. As mentioned, those who choose to do their own maintenance might be lying if they told you they have never missed a cleaning. The truth is, all aquarium owners will eventually delay or skip maintenance to the point where the aquarium environment starts to suffer. By opting for professional aquarium cleaning service, you get to experience the beauty and tranquility of an aquarium, without having to lift a finger to clean it. When you team up with Aquarium Illusions, your tank will never miss a cleaning again. We’ll even keep track of your aquarium maintenance schedule and alert you when different tasks need to be completed so you never miss a needed cleaning or water test. Regardless of whether you have freshwater or saltwater fish, it is important to ensure that they are healthy. Having an aquarium maintenance company come by your home or office regularly will help to ensure that your tank inhabitants are healthy. Additionally, they will check for any problems with the fish and will be able to alert you to those problems so that the proper measures can be taken. Another overlooked benefit of hiring a maintenance service is the fact that they will check your aquarium equipment when servicing your tank. Primarily, they are there to ensure that the tank is clean and that the fish are healthy. They are also accustomed to working with various pieces of equipment, including the aquarium pump. The technicians will often be able to identify any problems with the equipment a long time before you may discover that issue. Being able to correct those problems in advance of them breaking down can protect your fish tank even further. We understand that you can experience aquarium problems that require urgent service. That’s why Aquarium Illusions offers emergency aquarium maintenance after our hours of business. When you encounter an urgent issue with your tank or fish, our service technicians will quickly respond and offer assistance in any way possible. Of course, delegating your tank maintenance to an aquarium cleaning company will not only save you time and hassle, but will provide you, your aquarium, and your fish with plenty of benefits. We offer multiple levels of professional aquarium maintenance packages to ensure your aquarium is in tip-top shape. Check out some of the maintenance packages available for your aquarium setup. This package includes testing and maintenance of aquarium equipment only. The service will be rendered on a per hour basis, with a one-hour minimum required. The All-Inclusive Package is for those looking for complete aquarium maintenance. Aquarium servicing labor will be supplied, as well as service to all consumable supplies, fish, plants, decor, aquarium equipment, and other essential areas. Freshwater tanks served with this package will also receive a complete scene change each month. For commercial accounts, Lease Packages are available. This makes having an aquarium in your home or office easier than ever before! The entire system, including all consumable supplies, all fish, and all maintenance labor, is supplied by professional technicians from Aquarium Illusions. Our available lease amounts can be tailored to fit any budget. If you are interested in scheduling professional aquarium maintenance, or are interested in any of our other services, contact our maintenance manager to receive more information.